Dylan Thomas was born in Cwmdonkin Drive in the Uplands area of Swansea and much of his work was influenced by many of the places in and around Swansea Bay, Mumbles and Gower. The Waterfront City of Swansea is home to the oldest and newest museums in Wales and the largest indoor market in Wales, serving local delicacies such as cockles and laverbread (it’s seaweed!) and freshly baked welshcakes straight from the bakestone. The City also boasts indoor surfing at the LC and of course, the renowned Dylan Thomas Centre, home to the largest collection of Dylan Thomas memorabilia in the world. Follow the five mile sweep of Swansea Bay and you’ll get to Mumbles, with its medieval castle, quirky craft shops, art galleries and trendy boutiques. Not forgetting the wide selection of cafes and ice cream parlours (one boasting a secret recipe from 1922!). Take the coastal route from Mumbles to the UK’s first Area of Outstanding Natural Beauty, the Gower Peninsula, and explore award winning beaches and 34 miles of coastline. Try abseiling or wakeboarding, coasteering or surfing. Walk the coast path or play golf against a backdrop of breathtaking coastal views. If you would like to visit Swansea Bay we would be delighted to help you plan your trip. Please visit www.visitswanseabay.com for more information, including activities, accommodation, visitor attractions, places to eat, guidebooks, maps and lots more. 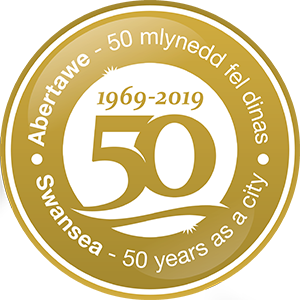 To find out what’s going on in Swansea Bay and to keep up to date with local news and fantastic events, please visit www.enjoyswanseabay.com. Swansea Bay is in south-west Wales, in the west of the United Kingdom, and is easy to reach by car, train, coach, sea, or air. On weekdays you can get a train to Swansea from any region of the UK, either direct or with one easy interchange at least every two hours and mostly every hour. Less frequent on Sundays. You can get a coach to Swansea daily from any region of the UK either direct or with one easy interchange at least once a day and up to five times a day from the larger centres. National Express Coaches to Swansea for times and fares information. Megabus to Swansea for online bookings. There are good rail and bus links to Swansea from London Gatwick and Heathrow Airports, Bristol Airport and Cardiff International Airport. Train: Heathrow Express to London Paddington then First Great Western London Paddington to Swansea, up to 20 trains a day. Coach: National Express direct to Swansea up to 11 coaches a day. Train: First Great Western Gatwick Airport to Swansea; interchange at Reading. Coach: National Express direct to Swansea up to 9 coaches a day. Train: Bristol Temple Meads (frequent bus link from Airport) to Swansea with one interchange en route at Cardiff, up to 20 trains a day. Coach: Greyhound direct to Swansea up to 9 coaches a day. Train: Rhoose (shuttle bus link from Airport) to Swansea with one interchange en route at Bridgend, up to 18 trains a day. Coach: Cardiff Airport to Cardiff Central (Airport Express) then interchange to Greyhound Cardiff Central to Swansea, up to 16 coaches a day.